OrgChart4U is designed to help a wide variety of organizations. It simplifies the search for colleagues and makes it easy to understand the organizational structures, even with complex hierarchies and geographical spread. Very secured, OrgChart4U uses a strong SSL encryption and our data is being kept in an industry standard cloud hosting facility. Can I navigate between members? Just click on the member's box in the hierarchy page. The hierarchy page of each member provides a link to the member's details page. In addition, you can click on the print button, and either save the hierarchy as a PDF document or print it out. How much hierarchical levels can I see? The hierarchy page allows you to show more / fewer hierarchical levels. Basically, there is no restriction on the number of levels. Can I find members with different criteria, such as finding all members who belong to the Finance Department? The members page allows you to search data and filter it by a wide range of fields, such as: department, location, title, etc. Can you hide the ads from my organization's pages? You can get access to our services for free or pay a competitive price, in which case the service will be provided without ads. The pricing and buying options are listed here. Can I share data in social networks? Sure you can! We provide you share buttons to all major social networks: Facebook, Twitter and LinkedIn. This makes sharing your hierarchy or member's profile easier than ever! All you need to do is allow your organization to be visible to the public. Is there a quick and easy way to import contact details to my smartphone? Certainly! We provide a matrix barcode on each member's page - so you can easily scan it with your smartphone and import the member's details. Is it possible to color code? We have several satellite offices and would like to differentiate between offices. You can easily color code each and every member of your hierarchy. You can even select different border colors for the member's org chart box. Can we change the color scheme to match our corporate logo colors? In the Edit Organization page you can select between 13 different scheme colors! Does your website have a learning tool that makes it easy to learn our org chart details, so that our executives can easily put names to faces? We have created our Game Of Charts especially for this purpose. In your home page, after you login, click on the "Game Of Charts" link from the left menu. Click on the employee's box to see his/her details, or just click on the "Get Another Team" button - and a randomly selected team will be displayed. I wish I could group together employees from different departments, but with similar skills. Is this possible? All you have to do is visit the Edit Member page of the relevant employees, and add as much tags as you need. For example, you could add a tag called "French" for the employees who can speak French. Or, assign a tag called "NG Project" to all employees who are working on the NG Project. 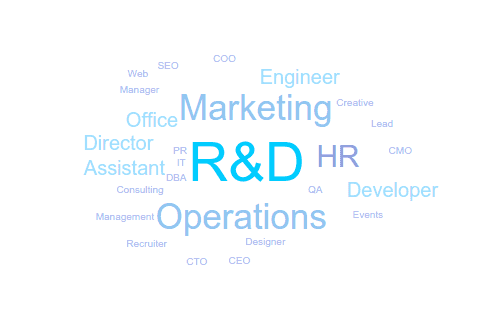 We even provide a Tag Cloud, as shown in the below picture, so you can quickly view which are the most used tags in your organization. Even better, you can click on each of the words in the Tag Cloud, and you'll be redirected to a page with all the employees who own the selected tag. How can I view the whole org chart? Navigate to your CEO's Org Chart page. Click on thebutton several times until you view all the employees (thebutton displays more hierarchical levels). How can I print the whole org chart? Use Google's Chrome web browser. Click on the print button in the org chart page. You should get a print preview form provided by your browser. At this stage you might see that the org chart is not well aligned on the preview form - in which case you should click on the cancel button of the preview form, and then reposition the org chart by clicking on the "move arrows" buttons. After repositioning the org chart, you should click on the print button again. You might repeat this step several times until you get a satisfactory result. On the preview form you can either click on the print button, or change the print destination (by clicking on the "Change..." button, and then select "Save as PDF") - so it can be saved as a PDF file. Please note that you can change the layout to "portrait", which might be more suitable for broader hierarchies. 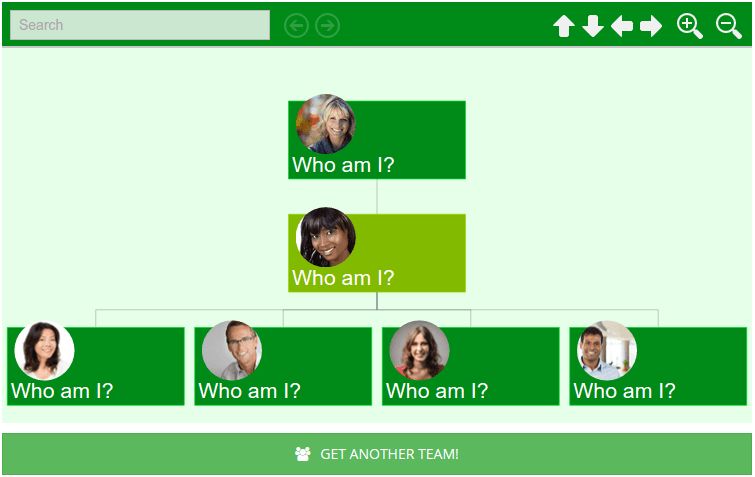 How can I add members to OrgChart4U? We support importing of a CSV file that most HR systems can generate. However, you can also add one member at a time on our Add Member page. When I go to the org chart tab, it only displays one person. How can I add connectors and get everyone together on a single page? Please go to the Edit Member page, select a manager, and click on the submit button. Doing so will create a hierarchical relationship between the saved employee and his/her manager. How can I invite new members to join our organization on OrgChart4U? Provided you have added these members to OrgChart4U with their emails, all you need to do is access the Invite Members page and proceed with a "Bulk Invite" process. You will have the option to select all or select multiple members to invite at once. When invited, the members will receive an email with a button to accept the invitation and set their password. After setting their password, the members will be redirected to their main home page. What are the different roles in OrgChart4U? Owner role: provides members full permissions - i.e. it allows to create, edit and remove members' data. Moreover, only owners are allowed to edit the organization's details. Member role: provides restricted editing permissions - i.e. it allows to edit only the data related to the specific logged in member. Viewer role: provides view permissions only. Can I import data from my organization's Google Accounts Directory? Please login with Google, go to your organization's page, and then click on the "Import Members" button. Next, please click on the "GET USERS FROM g+" button - and wait until you get a message saying that your data was successfully received from Google. Go to STEP 3, fill in the required "Title" field for all your users. 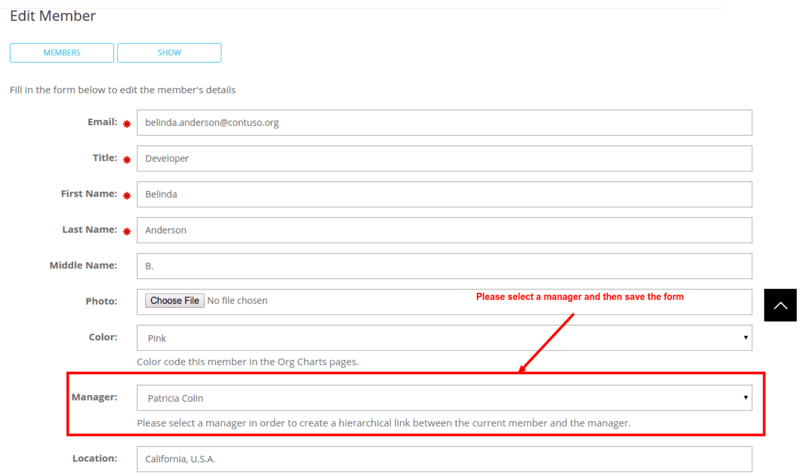 Please fill in the "Manager Email" field to create a hierarchical link between the current member and its manager. Can anybody see my organization's and members' data? In your organization's data page, you can specify whether your Org Chart - and consequently your organization's and members' data - should be made visible to the public, which means everyone on the internet will get access to this data - not only the members of your organization. Customers: Making your member contact details public, such as email and phone at work, will make it easier for people to contact the right person in your organization. Investors: Making your organization and org chart details public will clarify how your organization works. Social Sharing: Public data can be easily shared on social networks. A link to your organization page on OrgChart4U - so your potential recruitee can easily familiarize with your organization details, org chart, etc. In any case, we understand that making your organization data visible to all does not fit specific organizations - and hence we allow settings to keep your data private. If I have opted to make my organization's data visible to the public, will all my organization's and members' data be displayed?